Steller Sea Lions for Breakfast and Calamari for Dinner–A Balanced Diet for Killer Whales? Predation by killer whales has been proposed as a cause of the decline (and lack of recovery) of the western stock of Steller sea lions. The National Marine Mammal Laboratory’s (NMML) Cetacean Assessment and Ecology Program (CAEP) has conducted studies of killer whales in the Aleutian Islands since 2001. With the decline of Steller sea lions now occurring primarily in the western and central Aleutians, the focus of our killer whale research has shifted to that region as well. Bigg’s killer whales (also known as transient-type killer whales) are known to prey on Steller sea lions in other parts of the North Pacific Ocean, but no observations have been made of predation on Steller sea lions in the western and central Aleutians (although observation effort has been relatively sparse). 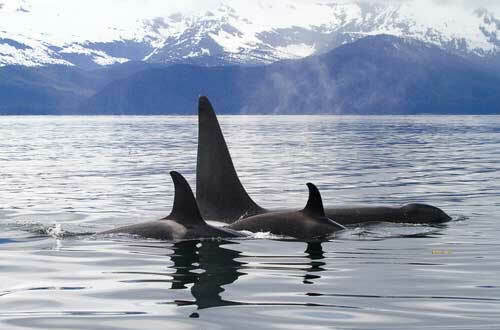 During CAEP surveys, Bigg’s killer whales have been regularly seen in two areas in the central and western Aleutians: 1) the Delarof Islands, and 2) Kiska Island and the Rat Islands, with abundance estimated at approximately 90 whales (Wade and Durban, unpublished data). A population of this size could easily cause the decline or prevent the recovery of Steller sea lions in this region if sea lions were their primary prey. The only killer whale predation events observed during NOAA Fisheries surveys in the central and western Aleutians have been of a Dall’s porpoise and a Cuvier’s beaked whale (Wade, unpublished data). Additionally, Estes et al. (1998) described predation on sea otters in the central Aleutians. From the use of location-only satellite tags, acoustic recorders, and stable isotope analysis of killer whale skin, two different hypotheses have emerged about foraging of Bigg’s killer whales in the central and western Aleutians. There are several lines of evidence that suggest squid could be important prey. There have been two observations near Kiska Island of Bigg’s killer whales with squid in their mouths, and nitrogen stable isotope values of Bigg’s killer whales near Kiska appear to be too low to represent a diet composed solely of marine mammal prey and are much lower than values of a separate population of Bigg’s killer whales in the eastern Aleutians and Bering Sea. Additionally, two Bigg’s killer whales in the Delarof Islands that were satellite tagged in 2010 stayed for 1 month in a relatively small area in deep (500-800 m) water over a submarine canyon, behavior that is consistent with foraging on squid. On the other hand, an acoustic recorder at the Gillon Point Steller sea lion rookery on Agattu Island in the western Aleutians recorded Bigg’s killer whale calls an average of 1 out of every 3 days in late fall and winter 2012 (Wade, unpublished data), suggesting substantial foraging on sea lions. To try to determine which of these foraging hypotheses (squid or Steller sea lions) is correct, Paul Wade (Alaska Fisheries Science Center), John Durban (Southwest Fisheries Science Center), and Russ Andrews (University of Alaska Fairbanks/Alaska SeaLife Center) received funding from the Pollock Cooperative Conservation Research Center to deploy dive tags on Bigg’s killer whales in the central and western Aleutians to see if the whales exhibited the repetitive deep-diving behavior seen in other species that forage on squid, such as sperm whales. In June-July 2015, Wade and Durban piggy-backed on NMML’s Steller sea lion research cruise in the central and western Aleutians (led by Chief Scientist Tom Gelatt) and deployed three tags on Bigg’s killer whales: two tags were deployed in the Rat Islands and one was deployed in the Delarof Islands (the two known hot-spots for Bigg’s killer whales in the central and western Aleutians). The tags were Mk10-A satellite-linked depth tags (Wildlife Computers) incorporated into the LIMPET (Low Impact Minimally Percutaneous External-electronics Transmitter) configuration (Andrews et al. 2010).